Imagine a Stage that Lights Up! Imagine a stage for your next event that lights up! That’s exactly what our LED stage rentals provide at your next event. Using LED lighting, these stages can be DMX controlled with your existing or rental lighting system, or used as stand alone units. With up to a million color combinations, as well as color matching, our LED lighted stages are the perfect centerpiece for your next event! Our clients use our LED stage rental services for a variety of applications. Corporate events that are looking for a modern design keep our lighted stages in high demand. In addition, fashion runways use our LED stages for high-end fashion events, and tradeshow and product placement companies use our LED stages for innovative product display. 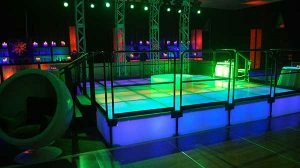 At In Depth Events, we’ve helped pioneer LED lit surfaces and dance floors, and our LED stages have been used all over the United States for special events. What options are available for LED stage rentals? Our LED stage rentals and lit surface stage rentals are built using a steel frame stage deck. The LED lighting instruments are placed on the floor (or in some cases, on a sub-floor) and frosted acrylic is installed for the surface of the lit stage. From there, we hook up power and DMX and you are ready for a stage centerpiece that your guests will be amazed with! We can also provide a number of skirting, step unit and handrail options. Skirting can be normal black velour, so only the top of the stage is lit; or, we can provide spandex or acrylic side panels so the sides as well as the top of your LED stage radiates light. We can provide lit step units and safety rails (if needed for height of stage) that can be black, chrome, or any other color you choose. Finally, we can provide custom stage pieces or multilevel installations for the ultimate customization for your event! Ask Us a Question about our LED stage rentals. You’ll find our event staff to be friendly and accommodating, and our onsite technicians to be well-dressed, polite, and masters of their craft. We look forward to hearing from you, and working with you!